As I mentioned in one of the comments, I went ahead and wandered onto the beach on my way to dinner. This is the Arctic Ocean. 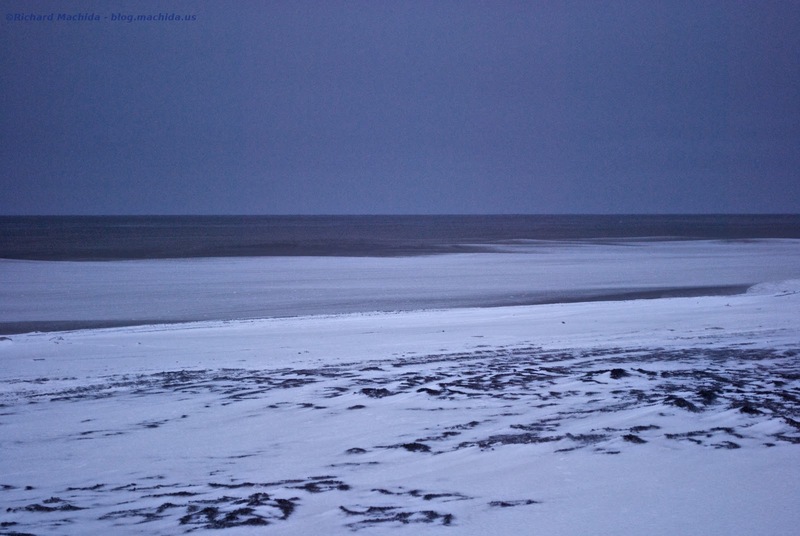 The snow on the beach is obvious but the white out on the water is not an artifact from slow shutter speed or something. That's really how it looked. I think it was the wind blowing droplets of water which froze as soon as they were airborne. I can't think of another reason but the result was really interesting. I thought you liked the beach? Looks like an another planet. Richard the Space Traveller. Today, the snow stopped flying and it was actually feeling warm out though still windy. Looks really cold! But I love the open, barren landscape (snowscape!). Looks like the edge of the world. What time is it getting dark up there now? Yesterday, it was. Today, less so. I just thought the white near the shore was so odd. I think it is turning into ice floating on the water. Today, sunrise is at 10:11am and sunset is at 6:08pm so there is quite a bit of daylight. The last sunset of the year will be around November 20th. Yup ... I had a whole other picture of 'beach' in my mind, but glad the water's not stiff yet! You mean there's another kind of "beach"? If the water is solid, you can walk on water. That looks a mite chilly. I think I'll stick with 60˚F and rain. I'm an Oregon weather weenie. The 65 knot gusts of wind and being peppered with little droplets of ice made it feel colder. It wasn't that bad… Though it was hard to walk a straight line due to the wind. Richard, it truly does look and the photos convey 'other worldly'. I know a little about cold and wind but still have trouble imagining even being there. If/when you learn more about the January Road Trip, please share. The blur where there are usually small waves coming into the beach really caught my attention. 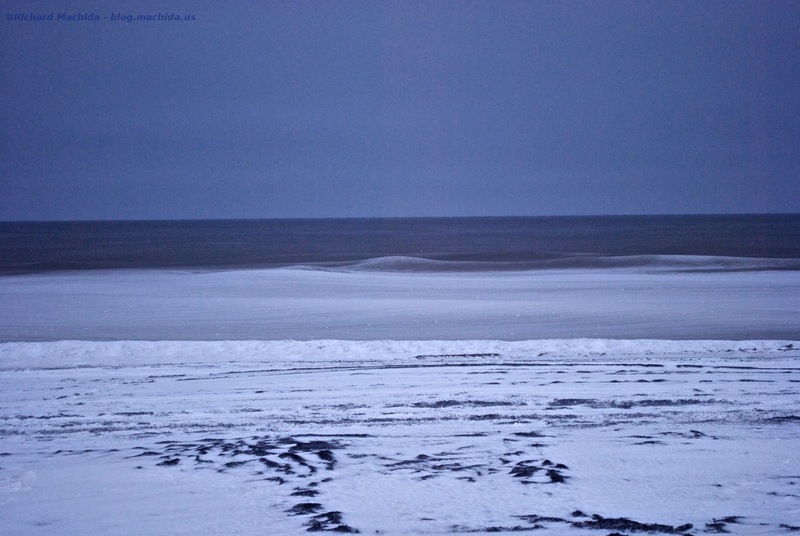 The next day, there was quite a bit of sea ice for about the first 100 m or so from shore. You could still see the wave action but not the water itself anymore. It did look a little "other worldly".